Have you ever wondered why you need a medical clearance letter? Most of us would have. As it seems to be a qualifying requirement standard to take up a treatment or get into any profession. Most of us would have faced this situation at least once in a life time. If you require to produce medical clearance certificate for getting into any profession, you need to pass the exams conducted by many medical institutions. In a nutshell, medical clearance is a thing which you get for ensuring and certifying your state of health. Why Do You Need a Medical Clearance Letter? Medical clearance letter is quite similar to medical clearance certificate. This medical clearance certificate will be given by the hospital indicating your health condition to do physical activities. Check samples of 5+ medical clearance letters available. Athletes usually go under a medical test to examine their physical fitness with regard to the sport. It’s important for an athlete to be mentally and physically strong and healthy to play at highest level. It is necessary to obtain a letter for participating in national and international games. Prior to the competition, one must produce the verified medical clearance letter from the certified hospital or medical centre. If the person is physically fit, he then undergoes with mental ability test, wherein he is tested to ensure whether he will be got a mental calmness even under pressure, power to concentrate, a winning attitude and confidence to face the competition. 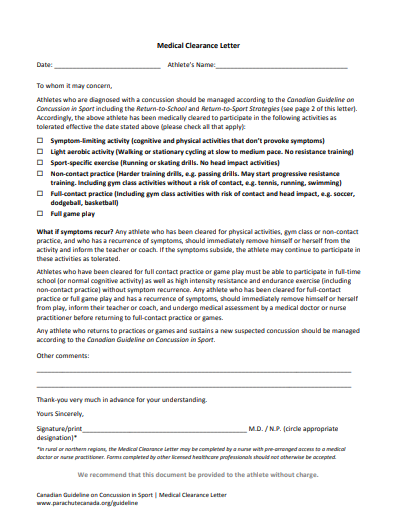 Check out this sample athlete’s medical clearance letter. Preop clearance letter can be prepared for those who have applied for undergoing a surgery. People who have been asked to undergo a surgery need to test their body to check whether they it is ideal to undergo surgery. Some surgeries lead to heavy blood loss, so people who have been affected by anaemia can’t undergo with such a surgery. In order to let the surgeon know about the patient’s health and their capacity to bear the blood loss, this clearance letter will be sought by surgeons. This medical clearance letter will be of appropriate results of lab works and tests. This letter also states the usage of anaesthesia before doing surgery. Check out the sample attached here. Whenever you expect to join any office or fitness program, which asks you to be flexible, you need to get a medical clearance certificate from a physician indicating your state of fitness. 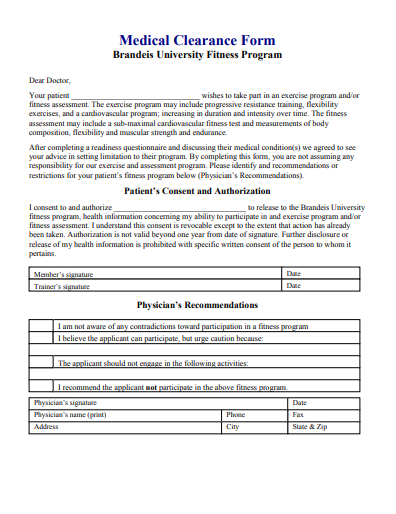 This fitness medical clearance letter includes patient’s consent and physician recommendations. Once you received medical clearance letter with a positive result, you will be taken as an ideal candidate for joining any program. Fitness clearance letter will be necessary in the events of exercise program, hard workmanship and athletics. Hormone replacement Therapy is common nowadays. In order to get this treatment one must produce medical clearance letter to the surgeon or a physician who performs the treatment. 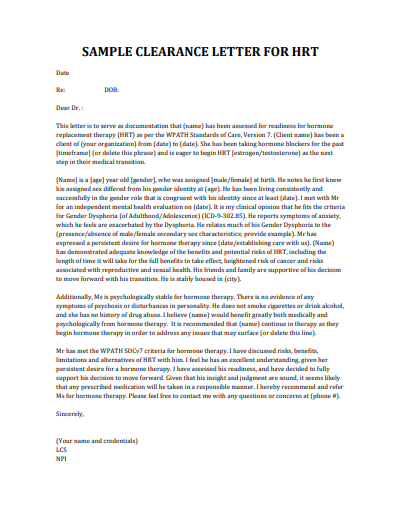 This medical clearance letter for HRT highlights person name and age, verifies the gender and checks whether he has any symptoms of anxiety or dysphoria. Once he is done with the basic physical test for taking treatment, he ensures the psychological stability of the patient. Along with this, the test also includes precaution measures to eliminate side effects if any. Finally the physician releases the letter declaring the results based on the tests conducted. 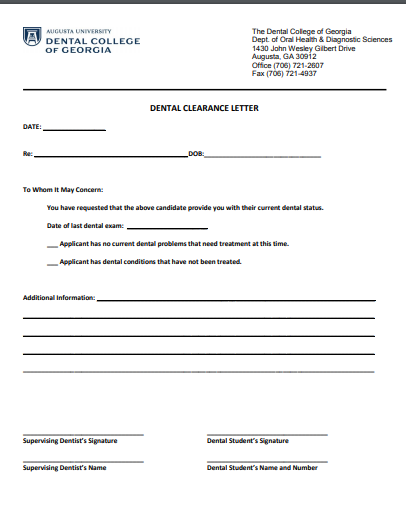 You may be surprised to know a dental clearance letter must be produced prior to the heart surgery. But it is a fact that you need to get a dental clearance letter from an experienced dentist in order to get into a heart surgery. It is because the common dental issues like gum disease, severe tooth decay, tooth abscess or any soreness in your tooth may harm the heart valve replacement surgery. The bacteria due to the poor tooth decay can travel to the site which needs to be treated by the surgeon. So, it is essential to have a dental clearance letter to perform surgery. To get this letter, you will be undergoing with several tests like X-ray which helps the dentist to find any damage or tooth decay causing breeding of bacteria. Check out the sample dental clearance letter here. Health clearance is the most important requirement if a student wants to go abroad for education. It must be produced by him prior to the journey. If it is not submitted, it may lead to legal issues. All the information in the medical form should be confidential, it also applies for students going abroad for education. 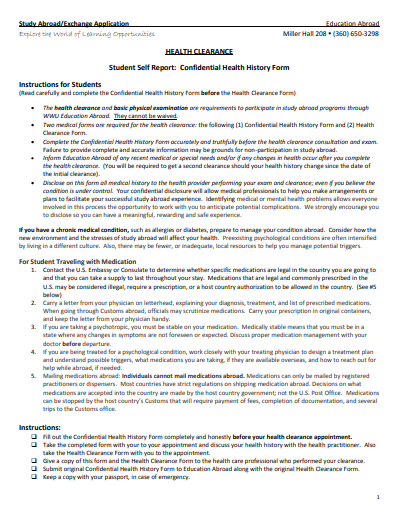 This clearance comprises of health report, instructions for student. It also includes drug/ food allergies, dietary restrictions, immunization records along with medical history. Do check the sample embedded here. It’s an obvious doubt that arises in everyone’s mind that why you need a medical clearance letter for you when you are fit to do your work and ready with all the confidential documents to fly. Yes, it’s an obvious question everyone would have had at least once. You need to produce a medical clearance letter whenever you are required to prove yourself fit for work that is assigned for you to do. So does medical clearance mean only for fit for work? No, not at all, you will be needing this for many other affairs too. In order to avoid some conflicts with international policies, here one needs to get this letter prior to their journey. This will certify your fitness to fly and it will be used as a proof that you are healthy while travelling from one country to another country.